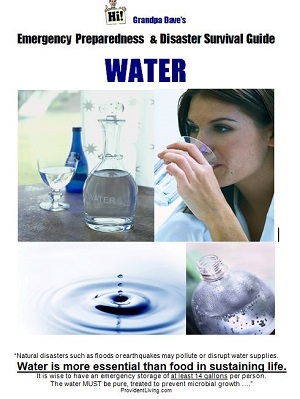 Years ago I did extensive research on water filtering / purification for emergency preparedness. The following is some of the information I gathered and put together for community and church presentations. A compilation of information dealing with everything you need to know about water to prepare for any emergency situations. 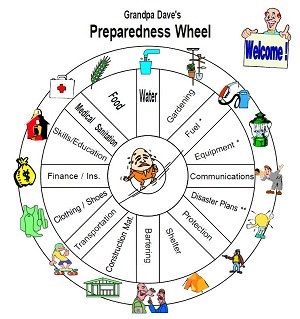 A chart showing all the areas that you need to include in your emergency preparedness plans ... both long term and short term. 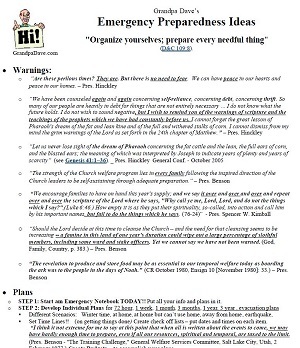 A few ideas about helping you with your emergency preparedness plans. The EPA also has a handout for suggestions for disinfecting drinking water by other methods. Here are some additional handouts/charts I used in my presentations. There is a filter that is derived from the technology used for kidney dialysis. It is made by a company called SAWYER. It is relatively inexpensive and is used throughout third world countries. They have several models which can filter out harmful bacteria, protozoa, cysts(E. coli, Giradia,Vibrio choleraie, salmonella). They also have another model which can filter out viruses. The filters which can be attached to a five gallon bucket (SAWYER POINT ZERO TWO BUCKET PURIFER) are only a few inches long and can cleaned and used for filtering thousands of gallons of water. Take a look at it.